A majority of Malaysian property hunters feel that there is a surplus in Malaysia and that most selling prices are unrealistically high, according to a survey by iProperty.com Malaysia. The majority of the respondents also planned to buy properties in the near future but were waiting for prices to fall further before doing so. iProperty.com Malaysia (www.iproperty.com.my), Malaysia’s No. 1 property website, is part of the iProperty.com Group (www.iproperty.com). The results of three separate polls,undertaken between February 11 and April 14 this year in three countries -– Malaysia, Singapore and Hong Kong – revealed similar sentiments. PETALING JAYA: A rare piece of land on Genting Highlands has been snapped up by YNH Property Bhd which will build holiday condominiums amid the rarefied air there. It is believed most of the land on the highlands is owned by the Genting group. YNH itself was surprised that there was land available and offered by a company. It completed the land purchase at the end of last year but did not announce it as the sum involved is not substantial relative to its equity. YNH paid RM16mil for 95 acres which an official described as being on the same level as the casino. “If it’s on the Awana or Gohtong Jaya level, we wouldn’t have bought it,” a company official told StarBiz yesterday. The Awana hotel and resort and Gohtong Jaya township are some distance below the peak of Genting Highlands and therefore, less cooling. The land that YNH bought is near the top where the temperature is around 15 to 16 degrees Celsius, he said. Although the land YNH bought is sizeable, only 30% to 40% is suitable for development as the slope on the rest is too steep. “We’ll use the rest of the land for a golf course and jungle trekking,” the official said. As for the development portion of the land, the official said the company estimated the gross development value (GDV) at up to RM2bil over 15 to 20 years. It is working on a GDV of about RM50mil an acre, which it considers achievable as high-end condominium projects in the suburbs of Kuala Lumpur can have a GDV of about RM100mil an acre. The official said the land had been converted from agricultural use to that of mixed property development. The company is preparing layout and building plans for approval from the Pahang state authorities, and hopes to launch sales next year. Beside the cool weather, a feature that led YNH to buy the land is that there is good road infrastructure that was built by the Genting group. The land YNH bought will also be accessible by the main Genting road. On YNH’s other projects, the official said the retail area of Kiara 163 had been sold for a total of RM200mil. Sales for the apartment units of this project in the Mont’ Kiara area of Kuala Lumpur have not been launched yet. Meanwhile, it has also sold the retail units in the first phase of Menara YNH, near Shangri-La Hotel in Kuala Lumpur. The units in the retail podium were sold for RM300mil and the company expects to start construction of that in three months’ time. Analysts, however, were disappointed at a recent briefing when they were informed of a further delay in the sale of one of the twin towers of Menara YNH to Kuwait Finance House. The sale and purchase agreement for that might not be signed till next year, they were told. SYARIKAT Pembenaan Yeoh Tiong Lay Sdn Bhd (SPYTL) saw all 60 units of three-storey shop offices in phase one of its The Trillium project sold within one week of its official launch, generating a total gross development value of RM60 million. Due to the unexpected strong demand, the second phase of The Trillium, offering 40 units of three-storey shop offices comprising 40 units, will be open for sale from RM1.14 million onwards. SPYTL general manager of property department Edward Lee said the sell-out of The Trillium has proven that a quality product with the right location can weather any cycle of the market. "This is coupled with our strong track record of delivering high capital appreciation on all our properties, in turn maximising value for us, our purchasers and our investors," he said in a statement issued last Friday. The Trillium is located in Sungei Besi, Kuala Lumpur. Featuring shop offices with built-up that starts from 4,805 sq ft, it is scheduled for completion by the first quarter of 2010. Besides The Trillium, SPYTL had earlier launched Midfields, a 9.315hamixed development project offering prime stylishly designed condominium units, retail lots and offices that is also located in Sungei Besi. The launch of Phase One of the Midfields condominiums in 2008 was an overnight success where 300 units were sold out in the first weekend of its debut. KRISASSETS Holdings Bhd, the owner and operator of Mid Valley Megamall in Kuala Lumpur, will focus on its internal operations this year to maintain its financial performance. In the year ended December 31 2008, it made a net profit of RM98.12 million on the back of RM216.63 million revenue. Group managing director Robert Tan Chung Meng said the company has put on hold earlier plans to inject new foreign retail and commercial assets into the company. At that time, property prices, particularly in the US, had plunged and made it an attractive investment option. Given the unpredictable economy, the fluctuation of the stock market and foreign exchange, KrisAssets has decided to tread carefully. Nevertheless, even taking over an ongoing project remains an option if the price is irresistible. Speaking at a press conference after the company's annual general meeting yesterday, he said KrisAssets has the muscle to consider one large project for merger and acquisition purpose, as long as it did not have the effect of increasing borrowings by too much. On the performance of The Gardens Mall, which is planned to be injected into KrisAssets when it achieves profitability, Tan said the high-end mall was doing better than in 2008. Although he expects gestation for The Gardens Mall to possibly even take up to five years, he is still hopeful that it will start making money faster. "The one to two year (timeframe to inject Gardens Mall into KrisAssets) is still on our roadmap. We want to unlock its value," Tan said. 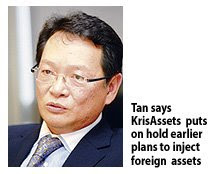 KrisAssets is 74.81 per cent owned by IGB Crop Bhd. IGB now owns the Gardens Mall which has a net book value of RM625.67 million. On whether rental collection has been an issue, Tan said that it is not to the extent that it has an impact on its performance. The mall is also working with its tenants to help them through the challenging times. Meanwhile, for the first quarter ended March 31 2009, revenue at the RM1.75 billion mall grew by 6.7 per cent to RM56.5 million from RM52.95 million. Net profit increased by 14 per cent to RM25.4 million from RM22.3 million in the previous corresponding period as total rental income improved while it incurred lower property maintenance cost. Metro Kajang Holdings Bhd's pre-tax profit for the six months ended March 31, 2009, rose to RM25.205 million from RM22.857 million in the same period of 2008. Revenue increased to RM175.293 million from RM149.773 million previously. In a statement today in Kuala Lumpur, executive chairman, Datuk Alex Chen Kooi Chiew, said property sales were encouraging. "Our non property-related activities also delivered commendable results, notably our manufacturing and integrated livestock divisions continue to grow in significance," he said. Chen said although economic uncertainty prevailed, the recent improvement in stock market sentiment could translate into overall improvement in confidence, especially in the property sector. He said the company planned to launch the initial phases for several key property projects over the next 18 months. "These new developments, which has a total estimated gross development value of RM1.5 billion, consist of township projects as well as the RM133 million-Melawati serviced apartments in Desa Melawati, Kuala Lumpur," he said. He said at the group level, the company has identified and would continue to build up four core divisions -- property development, investment, integrated livestock and oil palm plantation -- as future growth drivers," he said. NEW YORK: Prices of US single-family homes in March fell 18.7% from a year earlier, while prices in the first quarter dropped at a record pace, according to the Standard & Poor's/Case-Shiller Home Price Indices released on Tuesday. On a month-over-month basis, the index of 20 metropolitan areas fell 2.2% in March from February, S&P said in a statement. Price drops on both a month-over-month and year-over-year basis were worse than expectations based on a Reuters survey of economists. The composite index of 10 metropolitan areas declined 2.1% in March from February for a 18.6% year-over-year drop. "Declines in residential real estate continued at a steady pace into March," David M Blitzer, chairman of the Index Committee at Standard & Poor's, said in a statement. However, he noted it was the second month since October 2007 in which the 10- and 20-City Composites did not drop at a record annual pace.